The Vampire FaceLift is a revolutionary, natural method of using your own blood-derived growth factors to rejuvenate your face. The technique is a non-surgical, drug-free procedure that combines the science of hyaluronic acid (HA) fillers, your own Platelet Rich Plasma (PRP), and the artful eye of our skilled providers. Call us at 513-791-9474 to book an appointment. Dr. Lovett is thrilled to offer the Vampire FaceLiftⓇ procedure to empower women and improve their beauty goals. He trained with Dr. Charles Runels, creator of the VampireⓇ procedures, O-ShotⓇ, and P-ShotⓇ, to learn the inventor’s unique techniques. Only members of Dr. Runels’ provider group have been trained by him and are qualified to perform this procedure. Your Wellness Center is a licensed provider of the trademark Vampire procedures. Want to know more before or after your consultation? 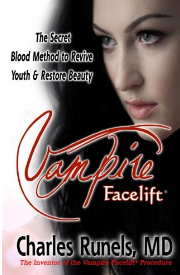 Stop by our office and ask for FREE a paperback copy of Vampire FaceLiftⓇ: The Secret Blood Method to Revive Youth & Restore Beauty by Charles Runels, MD, or buy a copy for $9.99 on Amazon. What symptoms does the Vampire FaceLift improve? What does the treatment look like? Hyaluronic acid filler (like JuvedermⓇ or RestylaneⓇ) is injected. This injection helps create a collagen structure for the PRP to build on, and sculpts and restores a natural, “plump” shape. While HA fillers lift the skin away from the bone to restore youthful volume and shape, they do little to improve skin tone and texture. Thus, both HA and PRP is needed to restore your complete youthful appearance. Blood is drawn and placed in a centrifuge. Just like any other blood draw, this blood sample will be taken from your arm. The blood sample will be put in a specialized machine to extract Platelet Rich Plasma (PRP) from your blood. This process will activate 8 growth factors that normally help heal wounds. Numbing cream is applied to the face to limit discomfort. PRP is injected into the face. Because your face has been numbed with the anesthetic cream, you will feel little or no discomfort. The growth factors activate multipotent stem cells already in your face, creating the magic reaction that increases collagen and new blood flow. What are the treatment areas? What does the treatment feel like? This is a quick, usually painless, non-surgical procedure for men and women looking to rejuvenate their face. Platelet-rich plasma (PRP) from your blood is injected into your facial tissue for enhancement and to stimulate your body’s natural healing process. The appointment is scheduled for 1 hour, but the actual treatment time is only 20 minutes. This ensures you have adequate time for us to draw your blood, answer questions, and discuss your goals without feeling rushed. While one treatment may be all that is needed, some people may desire additional treatments for further amplification. The effects of the treatment will improve for 2-3 months, and last for 1-2 years. It is recommended to have maintenance treatments every year. What pre- and post-care is required? There is no pre-care required. Some clients may experience bruising, but most will see a younger, natural-appearing face the same day as treatment. The effects of the treatment will improve for 2-3 months, and last for 1-2 years. It is recommended to have maintenance treatments every year. For more information, please see the “Vampire FaceLift consent” form in the box to the right. Our providers will work with you to minimize discomfort and/or side effects. Many men and women are able to get a Vampire FaceLift, however, this procedure is optimal for individuals who experience droopiness due to volume loss, dull-looking skin, and have lost their “rosy” complexion. Our medical providers will examine your medical history and symptoms to determine if this is the optimal treatment for you.